In January I wrote that we had experienced very little snow this winter. Those of you who live in Wisconsin, especially the northern half, know that that description is no longer the case. I guess I may have asked for it! 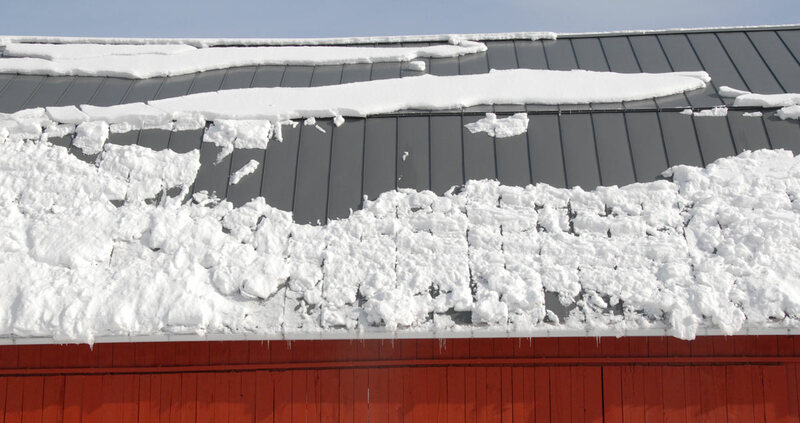 In February in Door County we have been hit by a regular progression of moderate to very heavy snow storms. Some have been accompanied by strong winds and dramatically drifting snow. 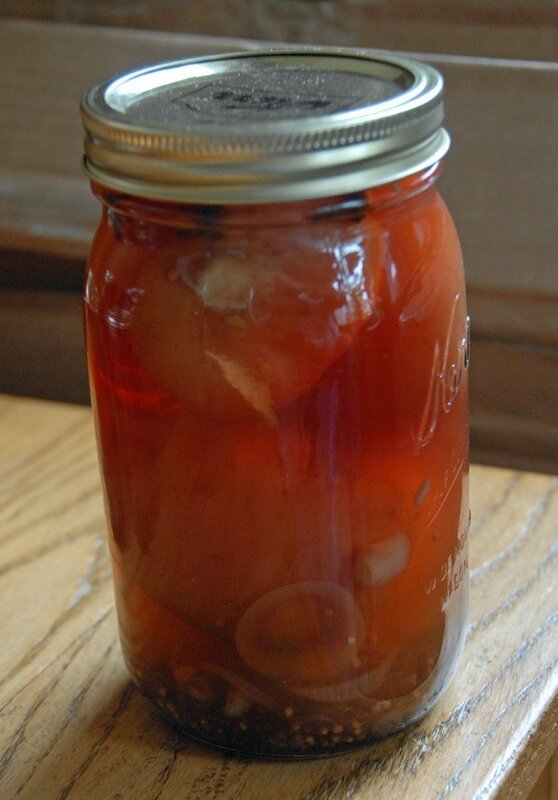 Some have included nasty doses of ice and freezing rain. A few of the snow falls, while heavy, have been very gentle, with no wind to speak of. 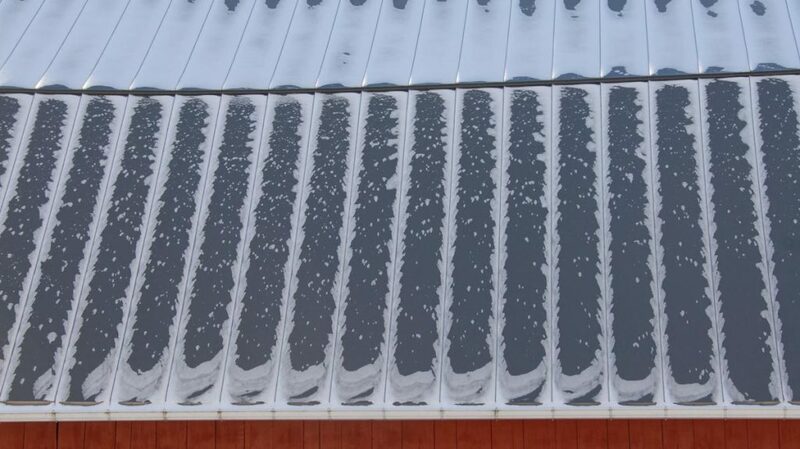 My collection of pictures of snow patterns on the barn roof has not grown much. 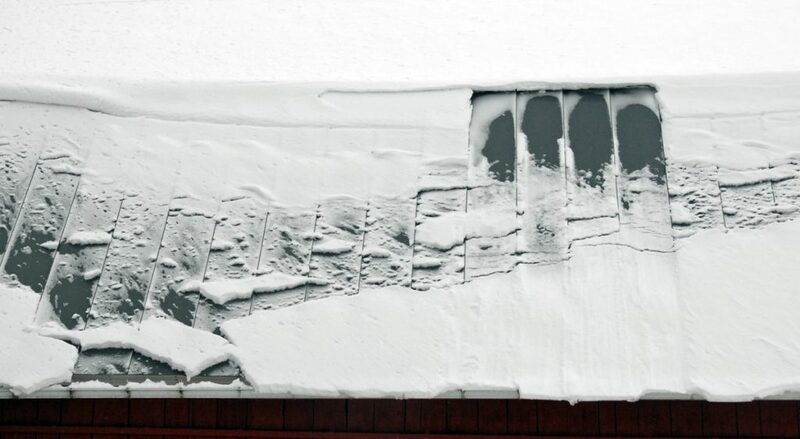 Either the snow was so deep that there was no roof surface to be seen, or the winds were so strong that the snow on the roof was completely blown clear. 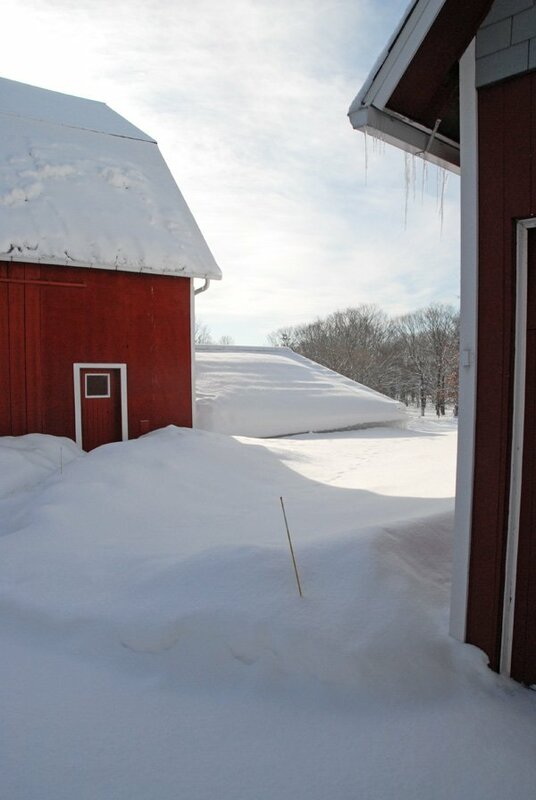 This is the view out our back door after one of the heavier snows in mid February. 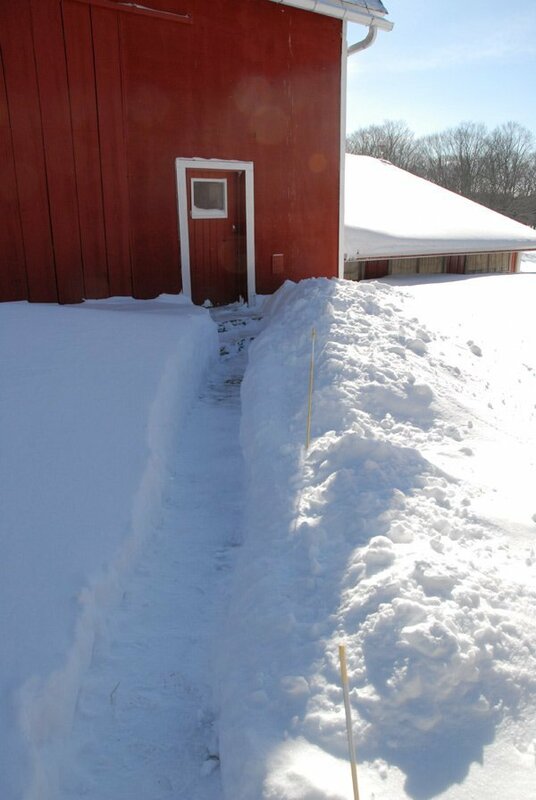 It took a while to shovel a path from the house to the barn before we could do chores in the morning. Perhaps the most dramatic storm occurred on the last weekend of February. It was a true blizzard with wind gusts of 60 mph, lots of snow mixed in with freezing rain and ice. The State Highway 57, less than a couple of miles west of us, was closed overnight due to accidents, white-out conditions and snow building up too quickly for the plows to keep up. 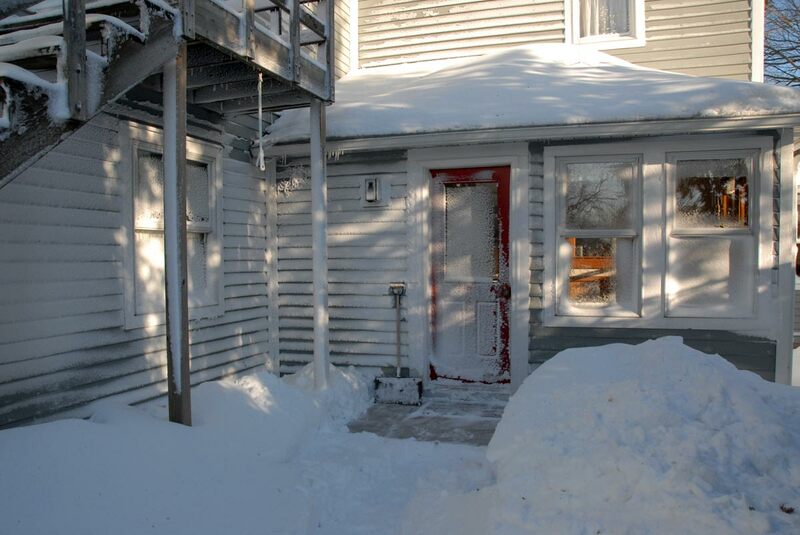 This is what the back door looked like the next morning after I got far enough out to shovel the porch step. A couple of days after I finally cleared the paths and driveway we got a lovely, quiet and peaceful snow fall of around 6 inches. That too has now been cleared off the driveway. Luckily, after its first temperamental performance of the year, the snow blower has be all cooperation for me. To date this winter our lowest temperature was -19.5 °F (-28.6°C). 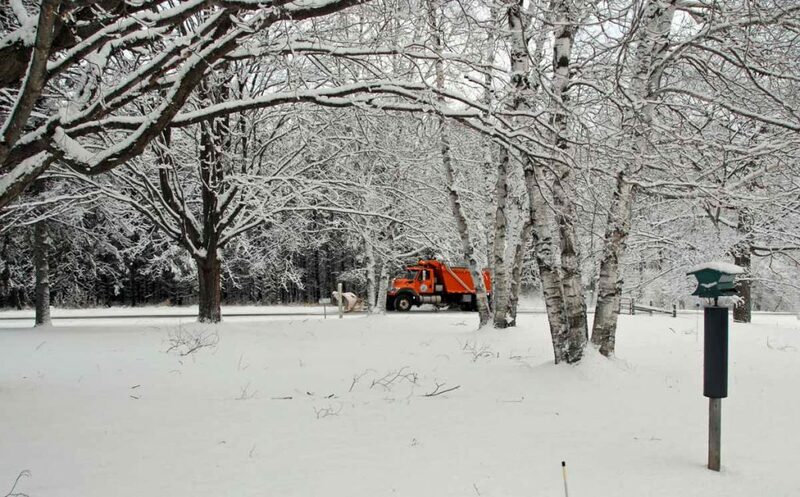 I do not have any official numbers for us, but this has set records in many places in northern Wisconsin for the snowiest February since record keeping began. Over 60 inches were recorded in Rhinelander. Sturgeon Bay received over 39 inches. Since much of our snow was “lake effect” snow from the east, I am guessing that we were well over 46″. 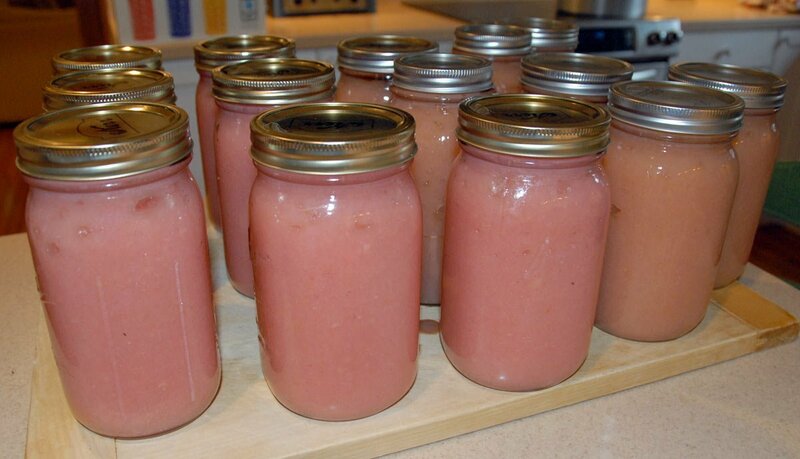 Most of the storms have been predicted well in advance, so we have managed to stock-up on supplies when the roads were clear and hunker down until the next storm was clean up. 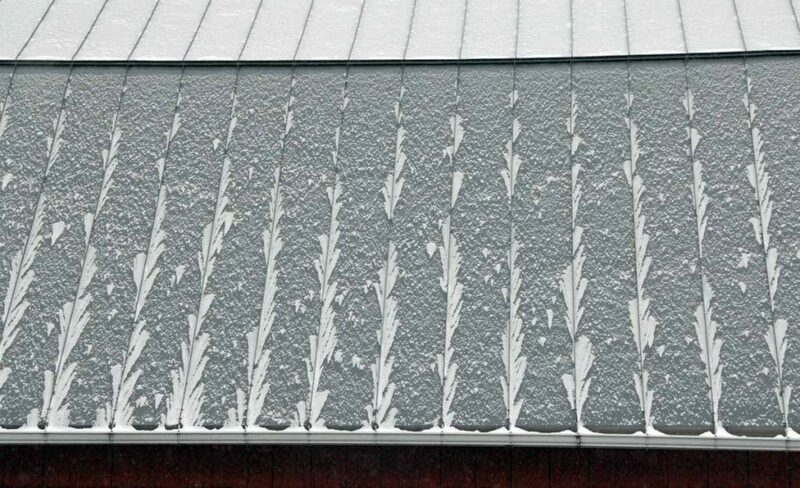 Here is my one and only interesting snow pattern on the barn roof. 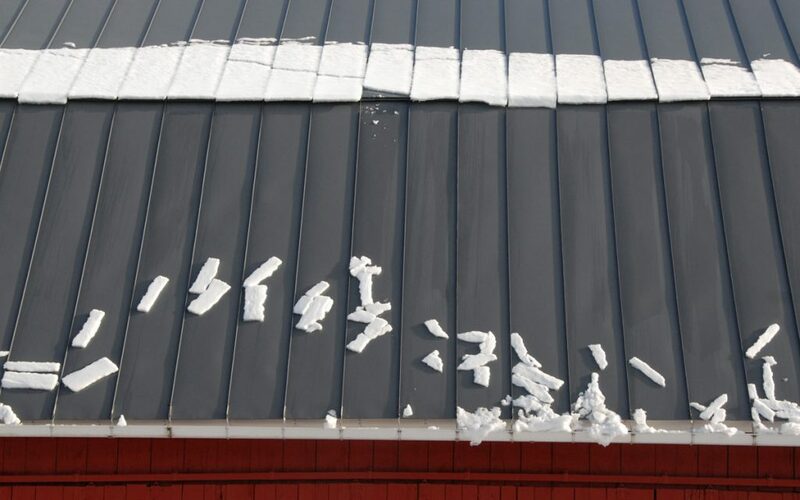 This view was after the last snowfall of the month: messy big globs of snow, ready to slide of the roof on unsuspecting shepherds. The next couple of weeks may prove challenging for us. We have about 12 days worth of round bales under cover in the barn addition. We also have over 30 bales under tarps behind the equipment shed (more than enough to make it thru spring). The only problem is the significant snow drifts that are covering those 30 bales. Sometime soon I will need to go exploring with the 4 wheel drive tractor and its large bucket to see if we can liberate some more hay for the sheep. Life has also had its humorous moments of late. 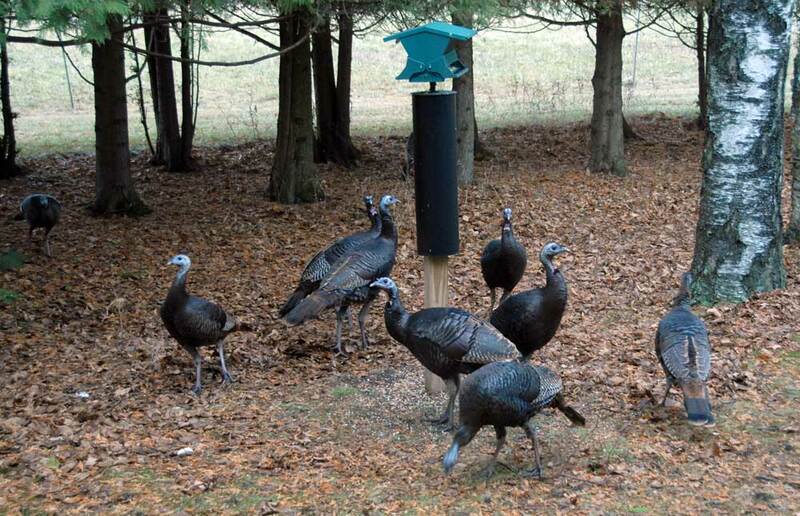 As I wrote last time we have had a large flock of Turkeys appearing off and on to clean up under the bird feeders. This group has included a number of adult females along with lots of this last year’s crop of chicks who are fast approaching full size. 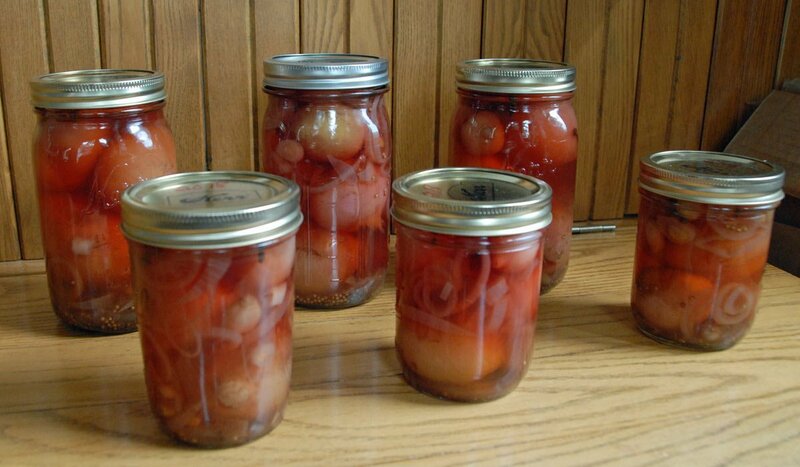 During the winder and colder weather they have disappeared. 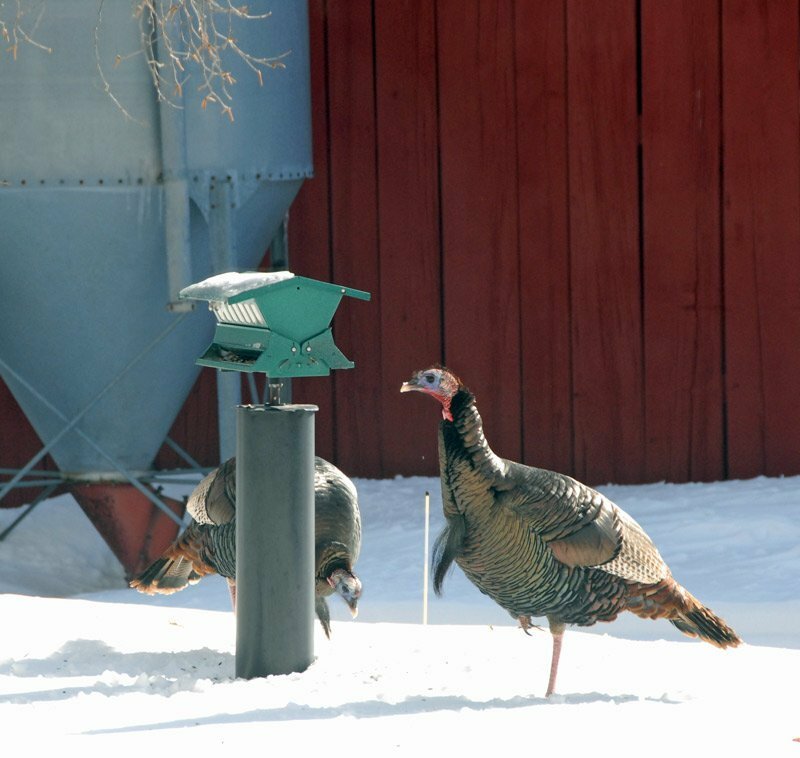 However over the last week, two very large tom Turkeys have paid us many daily visits. These two guys are very impressive in terms of size and coloring. 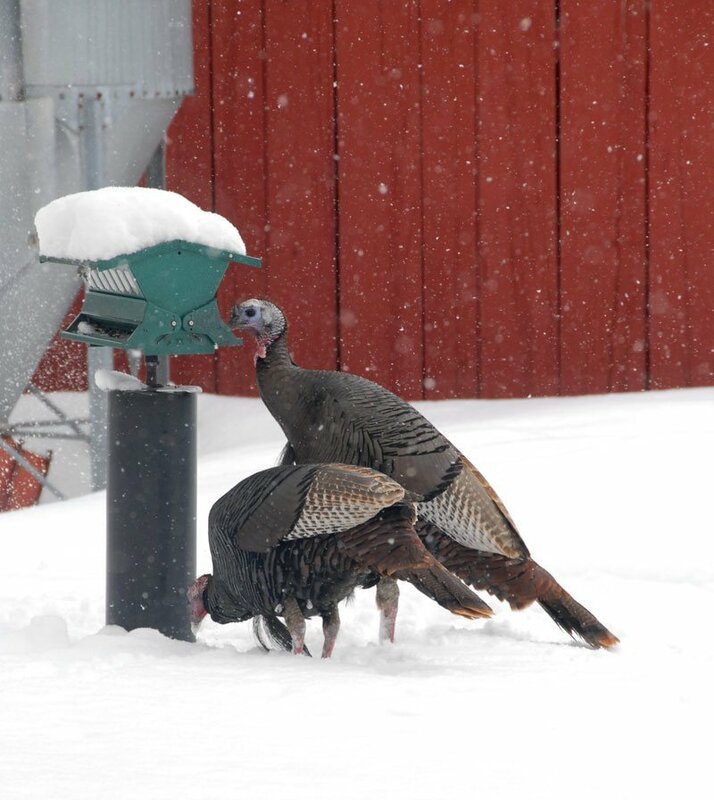 They have also discovered that the snow is so deep around the bird feeder next to the kitchen window that they can help themselves while looking down into the feeder. This image was taken the day after our blizzard. And then, here they are, during the next 6 inches of snow fall. That afternoon things had quieted down and the snow was a bit more passable. 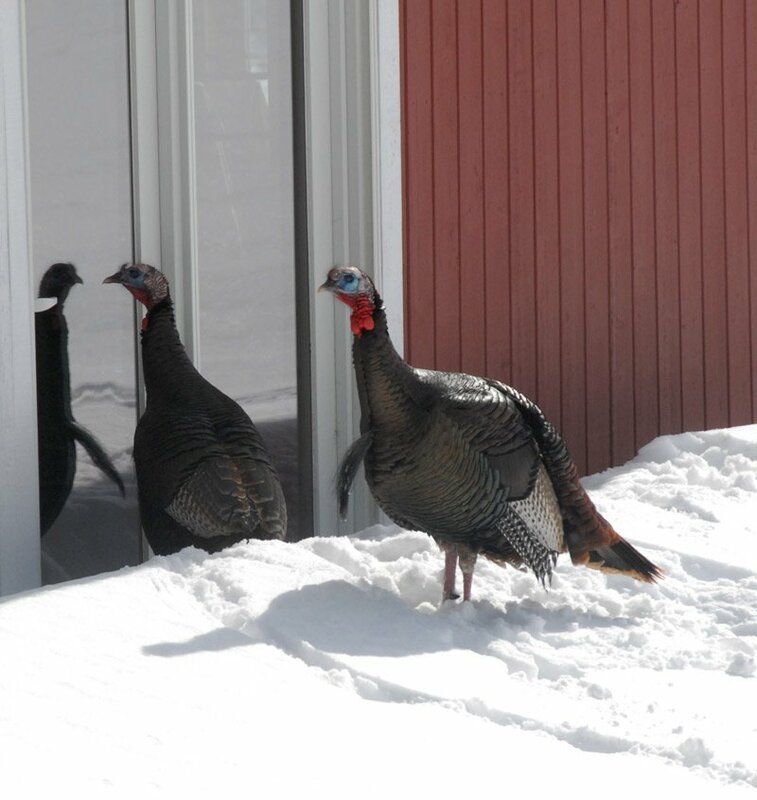 These two dudes decided that they better check out the male turkeys who live in the gallery. The spent quite a long time viewing the birds in the glass. Finally when no one responded, they got bored and left. At least we enjoyed the show! We have now left February and entered March, with another 4″ of snow overnight. This is the view that greeted me on the way to morning chores in the barn. Our snow “account” is overflowing. The barn addition will soon disappear if this keeps up. 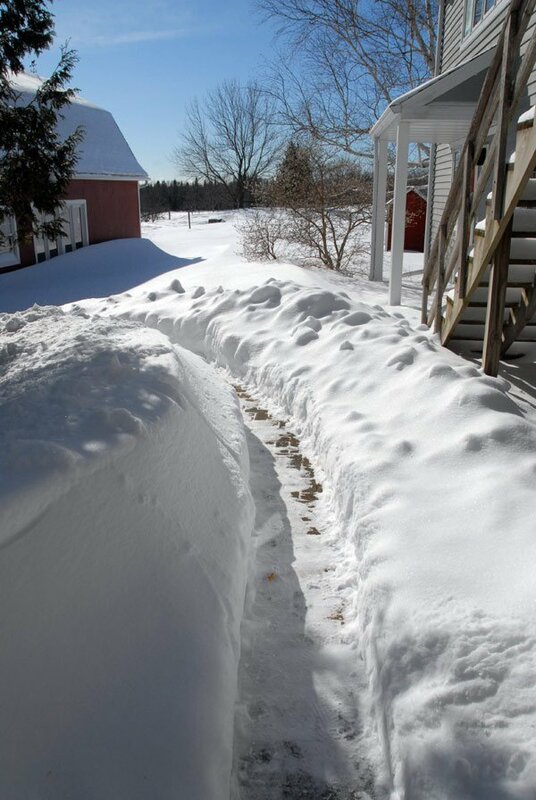 Time to clear the driveway…again…. It has been a month since I last wrote anything for the Ewe Turn. So many things have been going on here in that time that I will not be able to comment on many items. Therefore, what follows are merely a few highlights. Over the last thirty days we moved from early fall all the way into winter. As I write, we are experiencing our first significant snow fall of the year. It looks like before it is over we may have from 4 to 6 inches on the ground. 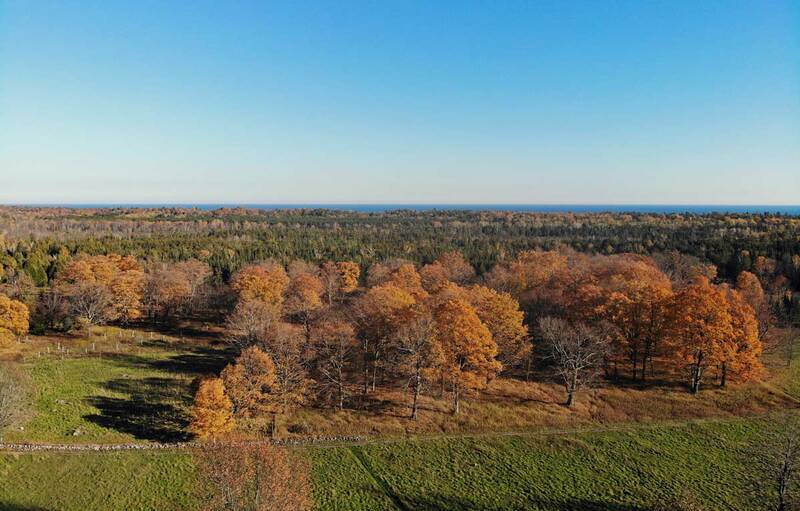 In early October we were blessed with some beautiful fall colors in the trees. There was a steady but gradual change in the shades, hues and their intensities. By the 22nd, most of the ashes were bare, along with many of the birches. The sugar maples and aspen held on to their leaves and their color. I managed to launch my drone at that time. 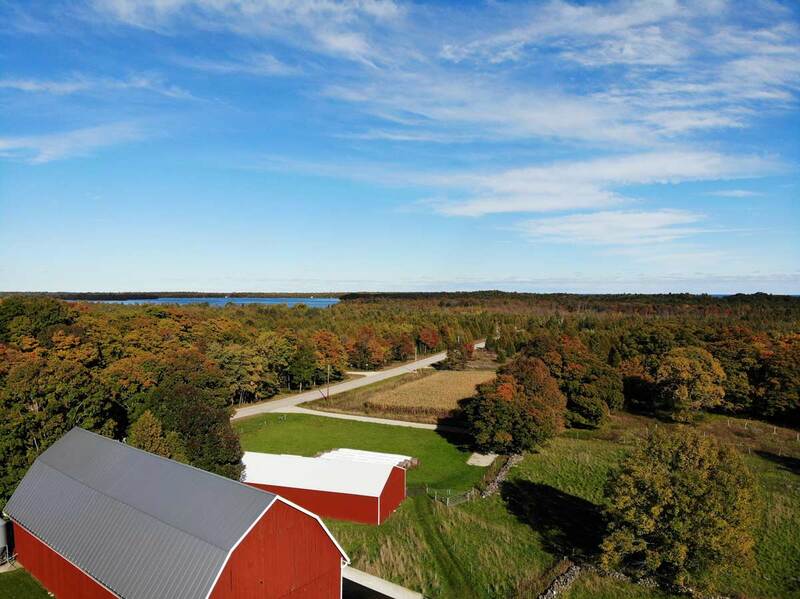 Here is a view to the east, including the house, farm buildings, Clark Lake close by and Lake Michigan in the distance. By this time our maple grove had lost its intense red/orange and yellow to a more subtle orange/yellows. Nevertheless it was still lovely. Within another week’s time we experienced heavy rains and strong winds. And with that weather the deciduous trees were bare! Interestingly, if I could again take to the air now there would still be some bright yellows showing up in the distance of this last image, despite the snows. The tamaracks decided to coordinate their late fall bright yellow show with great success. During this time we still managed to keep the sheep on pasture, at least in the dry weather. Two heavy, hard frosts were enough to cause all sorts of trouble with the water lines to the pasture. It was therefore time to call it quits with the grazing season. I had yet to clean the old bedding out of the barn. It was a crazy three days, but my trusty skidloader, Gehl and I got every thing cleaned up and re-bedded. Once the sheep moved into the barn for the winter I just managed to roll up all the removable fences and haul all the fencing, removable posts, and portable water buckets in for winter storage. With that done, all that remained was to drain the outdoor pipes when it was warm enough to completely thaw all of them. Actually, I did have additional help with the barn clean-up. 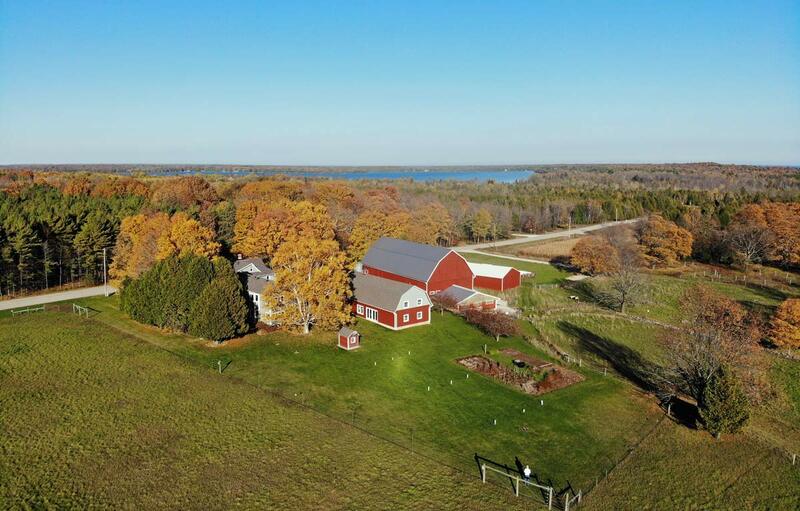 On the morning of the last day of that project, I had gotten the sheep out to pasture, had breakfast and was back in the barn moving some of the in-barn feeders in preparation for scraping the area with the skidloader. I was just about to hop into the skidloader when I realized that I had company. 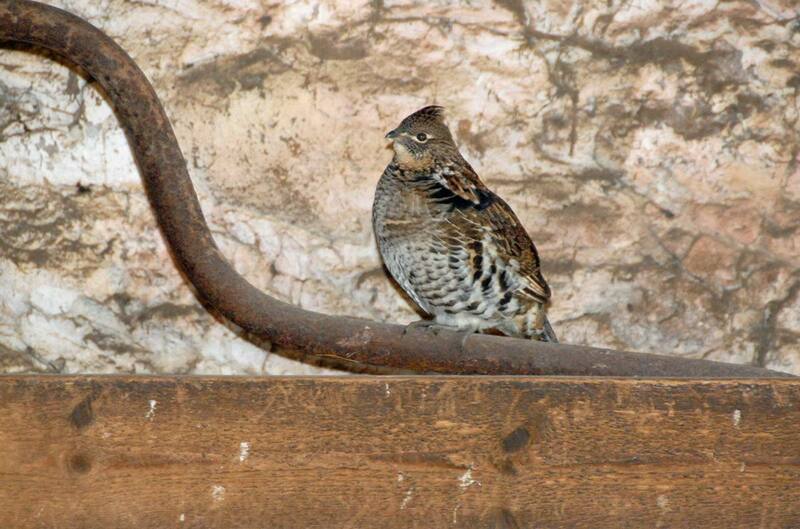 Not more than thirty feet away I noticed a Ruffed Grouse calmly sitting on one of the old dairy stanchion pipes. I walked back to the house to get my camera and returned to find that my friend had not moved. I managed to get within 10 feet of the bird before he got nervous. So my erstwhile helper/spectator decided to beat a hasty retreated, but not through the door to the outside, but up the stairs into the hay mow. It was the last I saw of him. 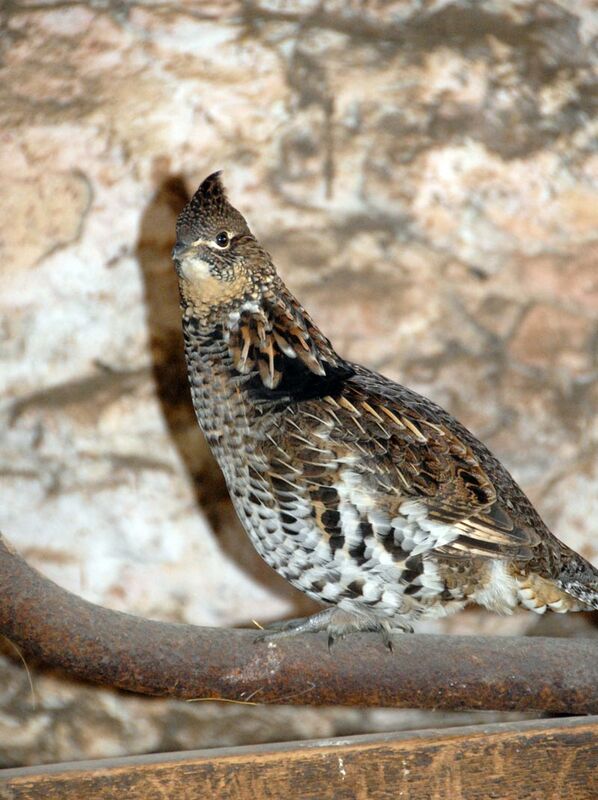 It is interesting how secretive the Grouse are. I know they are here, at least in small numbers, because very rarely, over the years, I will spook them in our woods. But to find one in the barn is very unusual. However, the corner in which he was sitting, is also the corner where our grain bin unloads. I wonder if he was there to pick up the random corn and oats on the floor. Which then makes me wonder if he has been a regular visitor without my knowledge. I guess I will just have to ask the next time we meet.